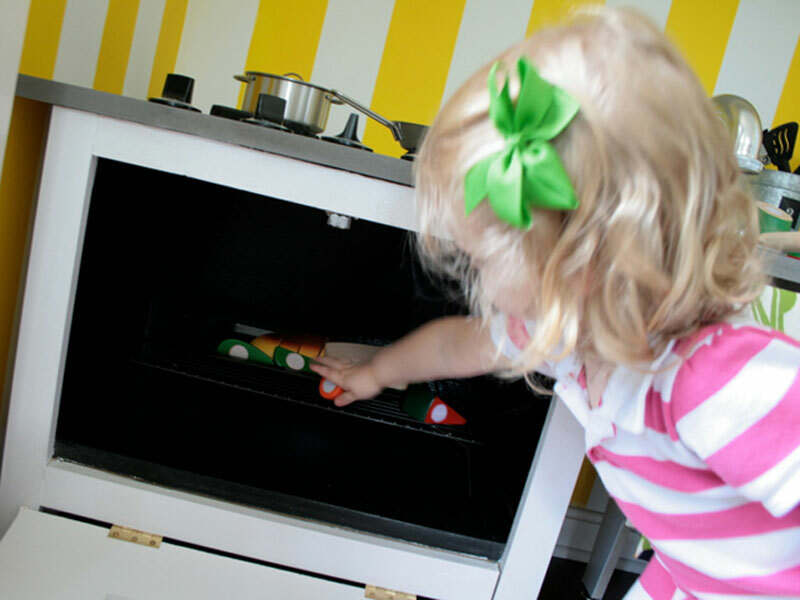 Plan Toys’ Kitchen Center has two sides so children can interactively play together while looking at each other. Complete with an oven, storage space, sink and utensil holder – it will provide hours of fun and comes in an assortment of colors. And as always, all Plan Toys kitchen sets have the highest standards in environmental and social responsibility — they’re made from renewable rubber wood and finished with non-toxic paints and stains. If you’re feeling crafty, you could whip up a kitchen reusing pieces of furniture from your home. Rachel from Southern Exposure created this fantastic kids’ kitchen using two old nightstands that she was no longer using. The best part about doing a kids’ kitchen yourself is that you get exactly what you want and you can design it to fit in the space you have available. Plus, reusing something that you already have to create something fantastic is always better than buying something new. If you’re looking for a children’s kitchen that’s recycled, simple and affordable, take a look at the Recycled Cocorico Cooker. This super sweet kitchen was created for Kidsonroof by Elisabeth Vida. Although this recycled cooker is simple and affordable, it also has fantastic details. Plus, it’s small and lightweight enough to be completely mobile – perfect for fun wherever you can imagine. Camden’s Kitchen from Camden Rose has superior craftsmanship and can be completely snap assembled in two minutes. 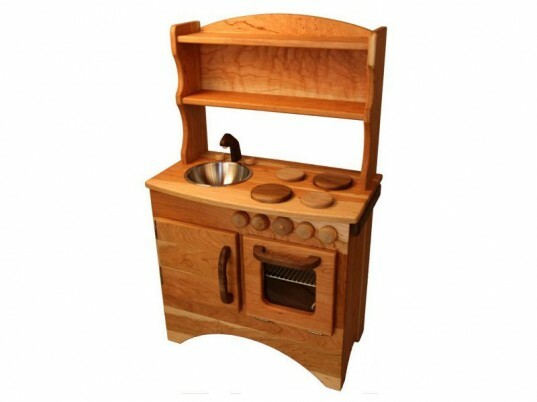 Camden’s Kitchen is crafted from solid cherry or curly maple wood and it’s designed for multi-generational play. It comes complete with a stainless steel sink, storage space and an oven. If desired, you could use non-toxic water-based stain to add a pop of color, matching it your child’s existing bedroom decor. This Complete Kitchen Center from Guidecraft is double sided making it the perfect kitchen for siblings. Children can play facing each other, making cooking and interacting a breeze. 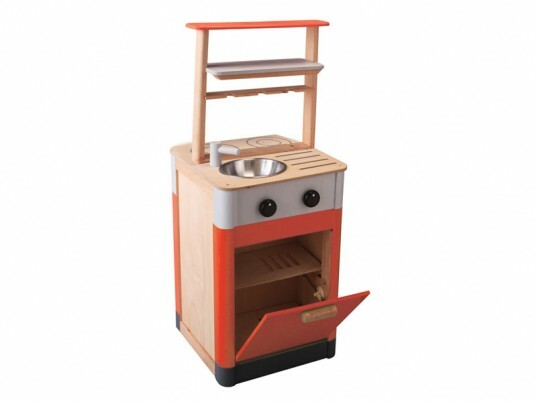 The Complete Kitchen Center is made using sustainable rubber wood and it’s non-toxic. This wooden play kitchen comes complete with a food prep area, dish-washing area and has working knobs and tons of storage. If you’re feeling creative and want to make a play kitchen for your children, but don’t know where to start, consider using one of Annie Wulick’s design plans. Annie sells her plans in her Etsy shop Forty Two Roads. Each kit contains a fourteen page instruction manual that shows you how to create your own play kitchen with recycled cardboard, wire hangers and other odds and ends that you will find around your home. 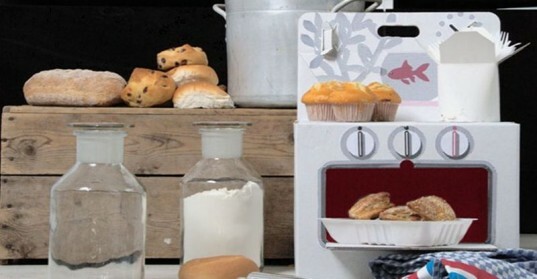 The Wonderworld Cooking Center Play Kitchen Set comes equipped with an oven with temperature and timer controls, a built-in refrigerator, a sink and plenty of shelf space. 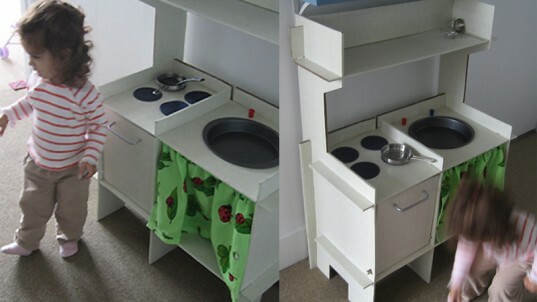 Made from replenishable rubber wood and painted with non-toxic water-based paints and biodegradable fabric, this kitchen is compact enough for apartment dwellers. 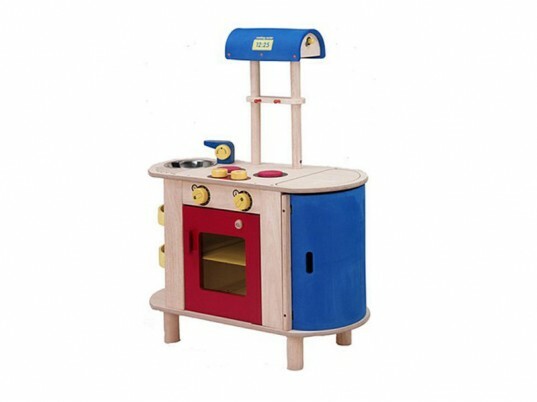 Plan Toys' Kitchen Center has two sides so children can interactively play together while looking at each other. Complete with an oven, storage space, sink and utensil holder - it will provide hours of fun and comes in an assortment of colors. And as always, all Plan Toys kitchen sets have the highest standards in environmental and social responsibility -- they're made from renewable rubber wood and finished with non-toxic paints and stains. 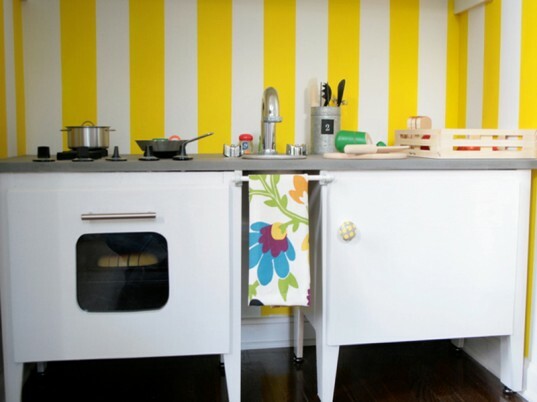 If you're feeling crafty, you could whip up a kitchen reusing pieces of furniture from your home. Rachel from Southern Exposure created this fantastic kids' kitchen using two old nightstands that she was no longer using. The best part about doing a kids' kitchen yourself is that you get exactly what you want and you can design it to fit in the space you have available. Plus, reusing something that you already have to create something fantastic is always better than buying something new. If you're looking for a children's kitchen that's recycled, simple and affordable, take a look at the Recycled Cocorico Cooker. This super sweet kitchen was created for Kidsonroof by Elisabeth Vida. Although this recycled cooker is simple and affordable, it also has fantastic details. Plus, it's small and lightweight enough to be completely mobile - perfect for fun wherever you can imagine. Camden's Kitchen from Camden Rose has superior craftsmanship and can be completely snap assembled in two minutes. Camden's Kitchen is crafted from solid cherry or curly maple wood and it's designed for multi-generational play. It comes complete with a stainless steel sink, storage space and an oven. If desired, you could use non-toxic water-based stain to add a pop of color, matching it your child's existing bedroom decor. This Complete Kitchen Center from Guidecraft is double sided making it the perfect kitchen for siblings. Children can play facing each other, making cooking and interacting a breeze. The Complete Kitchen Center is made using sustainable rubber wood and it's non-toxic. 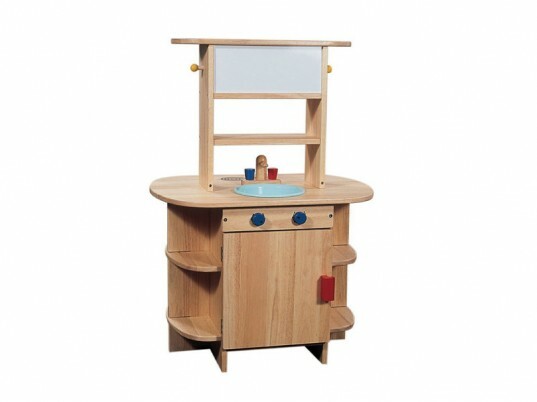 This wooden play kitchen comes complete with a food prep area, dish-washing area and has working knobs and tons of storage. If you're feeling creative and want to make a play kitchen for your children, but don't know where to start, consider using one of Annie Wulick's design plans. Annie sells her plans in her Etsy shop Forty Two Roads. Each kit contains a fourteen page instruction manual that shows you how to create your own play kitchen with recycled cardboard, wire hangers and other odds and ends that you will find around your home.